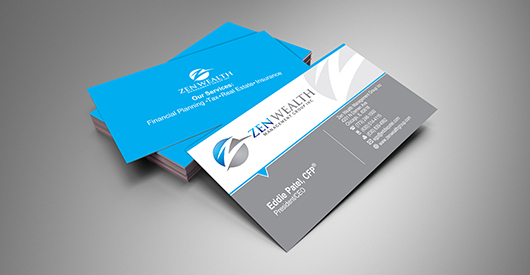 Zen Wealth Management Group, Inc. is a complete wealth management firm currently operating two offices with plans to open a third. The brief said that they serve 600 clients in/around Chicago providing them with tax, financial planning, real estate, and accounting/payroll services. It is a modern firm, utilizing the latest technology to improve service quality. They host a logo design and stationery contest on 110Designs describing designers to come up with a modern logo utilizing a striking color palette that will stand out, but yet be simple in its functionality. What they describes the means for the words “simple in its functionality” is that they should easily be able to add it to their stationary, brochures, flyers, and outdoor signage without too much reconstruction, color manipulation, or size altering. The styles they prefer was a letter based logo, but they said they are open to an abstract image as well describing the “Z” as probably most important if designing a letter based logo. We want to have a “corporate professional” identity but we want to convey that we are a little different in that our service suite for a small boutique firm is much more comprehensive than the competition. The brief said. See some of the logo designs they got. The prize they offer was just $200 and they received 25 logo designs in total. Check the one that they picked as winner to represent their firm. When the logo design is done, the Winning Designer then provide them with business card and stationery design they asked for. Have a look at the business card. This definitely is a risk-free, quick and simple way of getting a fresh, custom-made logo design at a wonderful price. Start now!